Yep, even after watching it again, that does not entice me onto a motorcycle. Even though it might seem strange revisiting this world without Damon, I enjoy (from the two trailers) Renner's energy. I haven't seen the other three in a while, and it looks as if LEGACY is the direct result of actions of ULTIMATUM. I smell a marathon before the summer is out! 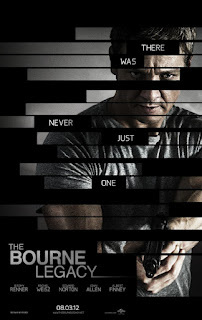 THE BOURNE LEGACY will be released August 3, 2012 starring Jeremy Renner, Rachel Weisz, Edward Norton, Joan Allen, and Albert Finney.